Learning how to tell the time can be a very difficult task! 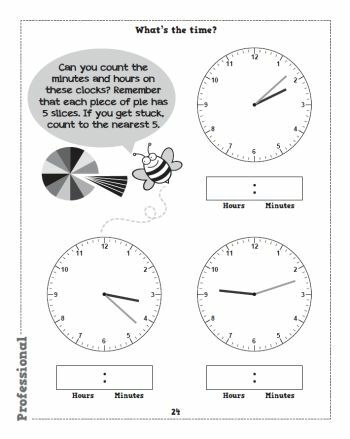 There are many different parts to a clock face which all help each other in order to tell us a very important thing - the time! Once we break the stages of learning into smaller sections and tackle one thing at a time, it's not such a daunting thing to do after all. This book is split into 3 stages. In Section 1, we use our knowledge of the big and little hands on a clock to tell the time, after first explaining what the hands are and the difference between them: how one hand is always used to tell us which hour it is, and how the other hand is always used to tell us how many minutes have passed in the hour and, of course, how to know which hand is which and how they each move around the clock as an hour passes. Section 2 gives you 3 time options to choose from in order to tell what the time is on the clock. By referring to the clock as a pie, it is much easier to split the many pieces up. With plenty of questions to practice on, this section will help to bolster and confirm the learning derived in section one of the learning the time book. Finally, section 3 requires you to utilise all of your new skills and draw the hands on the clock face yourself! Again, this starts off with easier times so that you get the hang of it. Although it might appear daunting at first, this section of the book which involves actively writing down what a time looks like rather than reading off the time is the final skill that will turn you into a time wizard! Each section is split into 3 different levels; Beginner, Intermediate and Professional. By working your way through the task sheets, you will slowly but surely become a pro in no time! 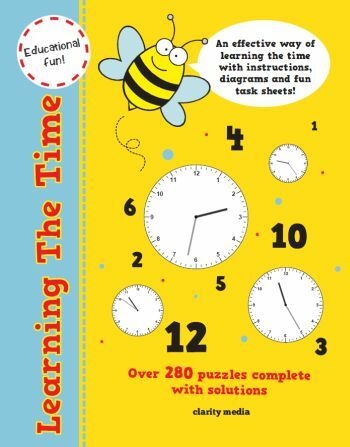 With over 280 puzzles included, this book is great practice for telling the time. We hope that by the end you will become a professional time master! Are you up for the challenge? Have fun, and don't forget all of the answers are towards the back of the book if you get stuck along the way. Keep your eyes peeled for Bert-Bee who will pop up to give you handy tips!